Question: Each of us feels the importance and need for physical contact in the group and the groups of ten for the sense of confidence and importance one feels in the connection. What can replace the lack of physical contact? We listen to the daily lesson every morning and have different committees. We get text messages every hour, but physically we get together only once or twice a week. Answer: The point is not how many times you get together but how many times you come in contact with people on the outside. The spiritual work is as follows: The Creator is above, and below the Creator there is the group, in the group, there is the teacher (Rav); all the Kabbalists from whom we have received our method surround the group and the teacher, and below there are the masses, society, the people. First, we have to connect in the group. This unity is essential when each one exits himself, performs the first restriction, creates a Masach (screen), and connects to others. Then we connect to the Creator by wanting to bring Him into the group, which is the second part. Third, when the Creator is already among us, we go out to the people. Among the people we begin to feel that it’s not enough for us since we discover different deficiencies. Then we return to the group and in it we return to the Creator. Through the group we are empowered by the Creator, and then we return to the people. Thus we constantly perform this cyclical work. So physical contact is not enough, we have to engage in external dissemination through the group. Our whole group is called Israel, Yashar-El (straight to the Creator). What does Yashar-El mean? Where can we discover Him? In the same place where there is a desire that was created by the Creator. The Creator is Light. We are in the middle, like a switch. Israel is the conductor through which this connection is fulfilled; this is all our work. Therefore, we cannot connect to the Creator if we have no contact with the public, since together with the group and all the Kabbalists, we are not considered a created being. We are an artificial creation that the Creator has created in order to fulfill the connection between Him and His created being since we operate by the desire in our heart which He has given us. The point in the heart is what is typical of our group. We don’t generate this point; it’s the Creator’s attribute from above. We work from this point, so we can only be the switch, the connector, the conductor, between the Creator and the desires. The Creator is Light. There is a desire and there is the Light that has to correct the desire and to fill it. We are in between the two and we have to fulfill this. You can listen to as many lessons as you wish and have committees, but it will lead to nothing. You will actually remain on the same level for 10 to 20 years until you dry up and leave this useless business since you don’t engage in disseminating to the public! The wisdom of Kabbalah is the revelation of the Creator in this world! Read the definition of the wisdom of Kabbalah in Baal HaSulam’s article “The Essence of the Wisdom of Kabbalah.” The wisdom of Kabbalah is the revelation of the Creator to the people in our world. This is His desire, His goal, and the reason for all of creation. We have to fulfill this goal. But in whom? It’s done in the masses, not in us. If we fulfill it only in us, we operate egoistically. The revelation of the Creator among the masses is not considered egoistic, since they don’t want it and have no desire for it; they are not egoists with regard to the Creator. They don’t need Him. We, however, need Him! So we have to work for them, to discover the Creator among them, and then this revelation will be altruistic with regard to us. 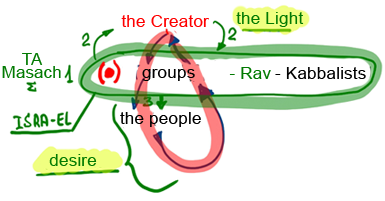 Study the diagram I drew and you will see that you cannot need the Creator if you don’t go out to the people. Only if you go out to the people and engage in dissemination will you feel that you need Him.